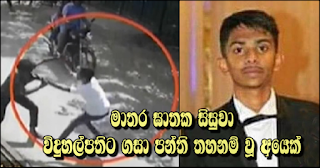 Matara killer-student was someone who had attacked principal and expelled from class! Various dialogues have circulated in the social media about the incident where a student was stabbed and killed near a tutory recently. What some people have said was that because scenes of teledramas such as 'Deveni inima' have become popular, such examples may have had a link to incidents of this nature. suspect, the student named Sithija living in Witiwala, Matara happens to be an advanced level student of a Matara school. Two other accomplices who joined him in this fracas have fled the area while the father of the main suspect has been taken into custody by Matara Crime Control Division. Suspect 18 year old living in Matara Hamugewattha who provided the motor cycle which brought them to the murder location and the other suspect living in Nadugala, Matara have fled the area by now. The main suspect before entering the school in Matara had resorted to assaulting the principal of the school where the former studied previously and on that count has been expelled from the class, it was revealed. At one other time he has assaulted the head prefect of the school for having been advised to have a hair-cut and come. There was also an incident where he had assaulted a bus-conductor too, it was revealed to police. The girl friend connected to this episode of killing had told the deceased student's brother of his misbehaviour of her boy friend and the clash has taken place when the deceased boy had gone to question about such misbehaviour. Even before this clash, a brawl has ensued at a us-halt in Matara in the presence of a large crowd of people. The police are due to interrogate the girl friend concerned.